That face was so amusing that I directly started vectoring after I saw it. Is it just me or is she cute when she's angry? carl johnson (gta sa):IF I STOPPED, YOU DEAD! DO I LOOK ANGRY TOO YOU !!!!!!!!!!!!!!!!!!!!!!!!!!!!!!!!!!!!!!!!!!!!!!!!!!!!!!!!!!!!!!!!!!!!!!!!!!!!!!!!!!!!!!!!!!!!!!!!!!!!!!!!!!!!!!!!!!!!!!!!!!!!!!!!!!!!!!!!!!!!!!!!!!!!!!!!!!!!!!!!!!!!!!!!!!!!!!!!!!!!!!!!!!!!!!!!!!!!!!!!!!!!!!!!!!!!!!!!!!!!!!!!!!!!!!!!!!!!!!!!!!!!!!!!!!!!!!!!!!!!!!!!!!!!!!!!!!!!!!!!!!!!!!!!!!!!!!!!!!!!!!!!!!!!!!!!!!!!!!!!!!!!!!!!!!!!!!!!!!!!!!!!!!!!!!!!!!!!!!!!!!!!!!!!!!!!!!!!!!!!!!!!!!!!!!!!!!!!!!!!!!!!!!!!!!!!!!!!!!!!!!!!!!!!!!!!!!!!!!!!!!!!!!!!!!!!!!!!!!!!!!!!!!!!!!!!!!!!!!!!!!!!!!!!!!!!!!!!!!!!!!!!!!!!!!!!!!!!!!!!!!!!!!!!!!!!!!!!!!!!!!!!!!!!!!!!!!!!!!!!!!!!!!!!!!!!! Rainbow Blitz: Do I look Angry to you?! Talk about an attitude adjustment! Does this look unsure to you?!? 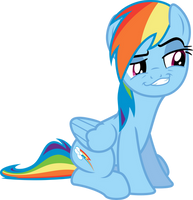 Hey Rianbow Dash, what's your problem? Hot head. Lemme guess, Rainbow's reaction to seeing Double Rainboom? Why does everyone hate Double Rainboom? I never saw it, but based on Mr. Enter and JoshScorcher's reviews, I believe I know why. While the animation is impressive and looks just like the show, it's probably the only good thing it has. 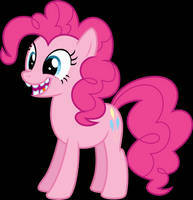 The voice acting was OK, but the best were Pinkie and Bubbles. Well if she truly was oh so a criminal, then why do the Mane Six stay with her? But this is some guy who claims he has "realistic views" (aka IMO looking WAY TOO DEEP INTO A CHILDREN'S CARTOON THAT ADULTS ENJOY) yet sounds completely hypocritical when he says Fluttershy in his opinion not developing is due to fact, not opinion, and says you should not be "subjective" when reviewing, what a stupid moron. But I digress, back to Double Rainboom. Two, most of the humor is just random references and such, such as the in the potion smoke, and there are all sorts of pointless references there that weren't needed, such as some Portal cube somewhere, Twilight stands by the fire left from the Double Rainboom and a certain film with a certain Delorean's theme plays, and so on. Plus there's also Transformers references towards the end. Third, Zach and the trailers lied. The trailers made people think that Double Rainboom was going to be the first fan made episode entirely accurate to the spirit of the show, but then we had the Powerpuff Girls (good show though, I love it) segment in there. Josh pretty much said it was someone's bad fanfiction put to animation, and it was I'd say. Also, Mr. Enter said there was nothing else in the episode that previously suggested crossover. Rainbow's OOC behavior adds to this, and that whole thing with Pinkie using her breaking the fourth wall powers as a Deus ex Machina; that never happened in the show. 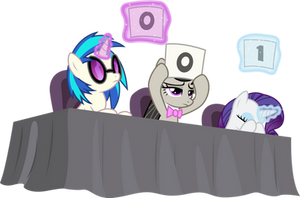 A way better Rainbow Dash episode than this is Mysterious Mare do Well, and I'm not trying to start a pointless debate, but that episode honestly is not as horrid as people say it is, to me anyways (and Josh didn't even think it was that bad). It did teach a better lesson than this thing, and Rainbow did act more in character (one thing I will say though is in there, she understood her friends' intentions even if she did get embarrassed, and her friends weren't acting as antagonized as people say they were), but I digress yet again. Those are my reasons why I think everyone hates Double Rainboom. If you like it though, that's fine, and I respect your opinion. That's a pretty detailed reason you got. I'll have to see this for myself. What are you talking about, just wondering (I'm confused, DR or MMDW)? DR is available on Youtube if you wanna see it. Someone re-uploaded it. Mostly DR, but what is MMDW(Sorry if I'm bothering you with these questions.)? Episode sucked balls this face was the one redeeming part of it all. Gotten better feels watching the news than what the episode tried to do, it's an episode about death make it a death and not hibernation. I agree; kinda harsh. Hopefully she won't do what she did again. I know right? It's like if you're a fan of the show then why are you hating on it? it also made me wonder something else; what happened to Owlicious? exactly, but what happens after that? the last we saw of him was him flying away. Does this look UNsure to you?! Aw I was going to make that joke. Say 'Hibernate' again! SAY. HIBERNATE. AGAIN! I dare ya! I double dare ya motherbucker! Say hibernate one more celestiadamn time! I wonder if anyone has posted that weird picture in the locker in Cloudsdale.